Have A Question For The Auxiliary President - See Bottom Of Page "Ask The President"
We had our nominations and elections this past meeting, and I was nominated and re-elected as your President again for a 2nd term. I would like to thank all members who have entrusted me with this duty again. Also I want to thank the members who have office again this year and especially the new members who were selected for their first time. Our main focus will be on membership. We also will focus in continuing support to our Veterans, Veterans families and our local community. Join The Texas VFW Auxiliary! Some don't realize that not just wives or husbands can join the VFW Auxiliary. Widows, mothers, fathers, foster and stepmothers, step fathers (who have performed the duties of parent), grandmothers, grandfathers, daughters, sons, foster and stepdaughters, step sons (who attained that status prior to age of 16 and for whom the duties of parent were performed), sisters, half-sisters/brothers, foster and stepsisters, step sons (who attained status prior to age 16) of persons who were/are eligible for membership in the Veterans of Foreign Wars of the United States can too! Members must be citizens of the United States older than 16. We encourage you join your local VFW Auxiliary and if you know who have brothers, sisters, fathers, mothers, etc., who are not already members -- we encourage them to join to and they don't even have to live within the same membership state! We already have many out of state members within our own Auxiliary. Some joined here, then moved, and some were signed up by one of their family members here. Auxiliary Eligibility Wives, husbands, widows, mothers, fathers, foster and stepmothers/fathers (who have performed the duties of parent), grandmothers/fathers, daughters/sons, granddaughters/sons, foster and stepdaughters/sons (who attained that status prior to the age of sixteen and for whom the duties of parent were performed), sisters/brothers, half-sisters/brothers, foster and stepsisters/brothers (who attained that status prior to age sixteen) of persons who were or are eligible for membership in the Veterans of Foreign Wars of the United States. Members must be citizens of the United States and not less than sixteen years old. 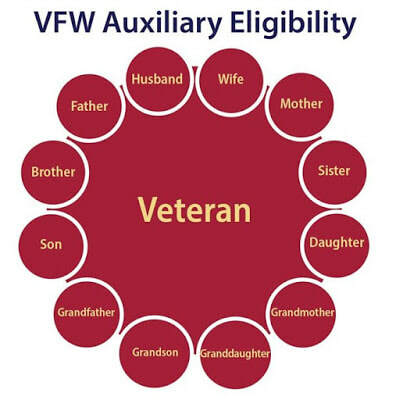 Men and Women eligible for membership in the Veterans of Foreign Wars of the United States shall be eligible for dual membership in the Auxiliary.